All children have the right to an education that meets their needs and supports them to achieve their potential. To be able to take part in learning every child needs to be safe and happy at school. As part of our commitment to improving the attainment of our pupils we monitor attendance on a regular basis and identify any pupil whose attendance causes concern. We all recognise that good attendance is vital in ensuring our children have the best possible education. There has been a huge amount of research over the last few years to find out what impact attendance has on how children progress and achieve. But what does good attendance look like? How will less than good attendance affect our children’s futures? 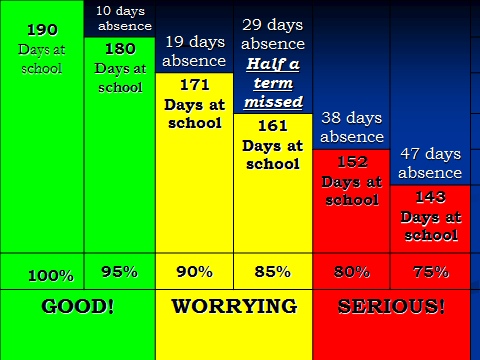 Please click here to see a short presentation on how attendance can affect your childs learning. Our target attendance figure is 96%. 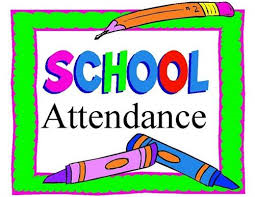 To see a copy of the Schools Attendance Leaflet please click here.